I already have a lot of Gible things, but there is always more I need! Here is a list of items that have remained illusive; if you have any of these for sale don't hesitate to contact me! 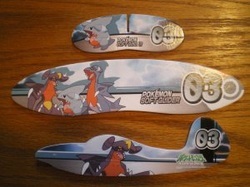 I used to love these plane gliders when I was younger, so when I found out a Gible one exsisted I just asdf's to death ;O I will pay a lot for this! I need any and all of these flats! Also any Gible flats not shown in my collection are very much wanted! 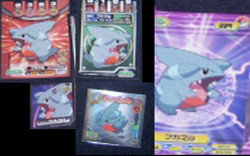 I've only seen this in Rentorar's collection, and I really really want this ;A; Unique gible artwork = want! Please please let me know if you have this for sale!